Cohen and player Jake Silbericht discuss plays during half-time in a game against Ashdod. ASHKELON, Israel — It is not unusual to see rugged young men going out equipped for battle in the hot sun of the Negev desert. But the young men who joined together in the southern Israeli city of Ashkelon on a Thursday in mid-July were facing engagement not on the battlefield — but on the soccer field. But what made the recent athletic event really special was that the Israelis were playing not soccer, but lacrosse, a relatively new sport in the Jewish state. Lacrosse began in Israel five years ago, when a national team and youth programs were formed. The Israel Premier League Lacrosse is now in its second year, with six teams and players from Israel and throughout the world. To make such a league successful, the key is good, experienced coaches to teach Israelis how to play and excel. Enter longtime lacrosse coach Ivan Cohen of Westfield. After he was a player on the team at Adelphi University that won the Division II national championship in 1979, he shifted to volunteer coaching at Westfield High School. In 2012 he served as an assistant goalie coach for the German national team and held the same position during the 2014 world championships. Cohen, who is 58, is a member of Temple Emanu-El with his wife, Alice Fertig; the couple has three children. Cohen said it was his old high school coach, Jack Kaley, who had the affiliation with the German team. That same coach called Cohen two months ago to tell him he had similar opportunities in other countries, one of them Israel. 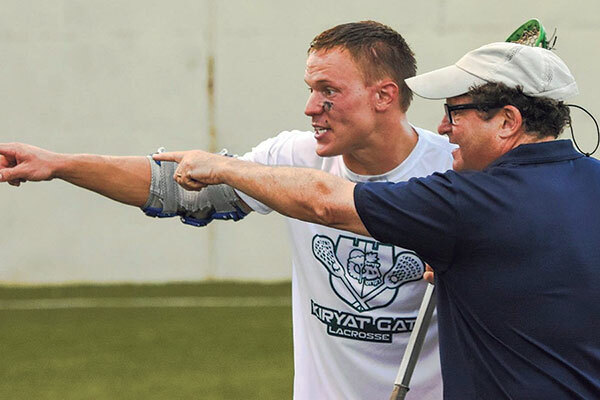 Cohen, who said he he had previously tried to get involved with the national team, jumped at the chance and was in Israel June 26-July 22; he was welcomed with open arms, where his extensive lacrosse knowledge and experience were appreciated. Cohen, who does not speak Hebrew, coached the team in the Negev development town of Kiryat Gat, and ran lacrosse teaching sessions for Israeli children. The experience was gratifying, he told NJJN, because the kids are so enthusiastic and his players have such a variety of backgrounds, despite lacrosse’s reputation for being an elitist sport. “If you had told me 10 years ago that I would be in Israel coaching lacrosse and there would be players from Africa, I wouldn’t have believed it,” Cohen said. “Kiryat Gat has exposed me to people who are not the Ashkenazi Jews I grew up with,” including Sephardim of numerous origins, as well as Russian immigrants, South Americans, and Ethiopians. Cohen led practices twice a week, coached games once a week, and taught the basics of lacrosse the rest of the time. Cohen himself is one of the Jews who has excelled at lacrosse and has been involved with the sport his whole life. The flexibility of his work in sales and marketing made it possible for him to take on this volunteer stint. Besides giving him the opportunity to reconnect with family members living in Israel, his stay in the country allowed him, because of the closer time zone, to continue conducting the business he does with China. The organizers of the league have learned lessons from the failed attempt at an Israel Baseball League. The league is being run with private funds and volunteers, and the players are amateurs; some of them are not even allowed to be paid because they are active in the NCAA. Neiss said only 15 percent of the players in the league are native Israelis, with the rest coming from spots around the world — but he intends to flip those numbers over time.